Every travel addict has dreamed of leading that nomadic lifestyle; moving from place to place, living somewhere totally new each month and never worrying about that homeward-bound flight creeping ever closer. Thanks to accessible technology and speedy WiFi this has become a reality for plenty of creatives and freelancers. But when you have the freedom to live and work anywhere, how do you choose? Here are some of the best digital nomad cities in the world! Chiang Mai is a big name in the digital nomad game, and one of the first cities where people from around the world started to embrace this way of life. If you’re just starting out, there’s arguably nowhere better. 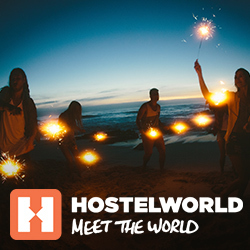 It couldn’t be easier to find a hostel for a long-term stay – they’re kind of used to people not wanting to leave. The huge number of nomads who’ve flocked here has led to co-working becoming the norm, and lots of trendy cafés with excellent WiFi have opened to accommodate them. Chiang Mai is also fantastic for the health-conscious nomad, with no end of veggie, vegan and health food spots. If there’s one thing besides WiFi that digital nomads can’t live without, it’s coffee. Colombia just happens to make the best in the world, and Medellin’s hundreds of coffee shops are the perfect place to work. The affluent, leafy neighbourhood of El Poblado is so full of cafes that you’ll be spoilt for choice. Medellin is a fantastic city to connect with other remote workers as there are loads of networking events – like the weekly nomad meet-ups on the rooftop of Hostel Ondas. All of the above are cheap places to live – that’s one of the reasons they became nomad hotspots! Here are a few more cities where nomads can live the high life for a lot less. A bit of a newbie on the digital nomad radar, Mexico City is shaking its dangerous reputation and growing in popularity thanks to exciting cultural places and events, outstanding food and a low cost of living. The city’s two most artistic districts, La Roma and Condesa, have a solid community of digital nomads and plenty of cafes and coffee shops that are used to having people working on their laptops all day. It also has the huge positive of being so close to the US, which means easy access and a minimal time difference to contend with. Almost every backpacker who’s explored South East Asia has spent some time in Hanoi. Travellers and digital nomads have fallen in love with it for the same reasons: welcoming locals, buzzing nightlife, incredible food and some of the lowest prices on this list. The Old Quarter is where you’ll find most of your peers, dotted around its hundreds of cafes probably sipping a famous Vietnamese egg coffee (a must-try). They may not always benefit from the same super-speedy internet as other Asian cities, but the nomads in Hanoi think that its countless positives outweigh this drawback! It doesn’t get much more relaxed than this place. A Sri Lankan coastal town that isn’t on the usual tourist trail, Dikwella is an established surf spot and is starting to be discovered by digital nomads thanks to beautifully bohemian co-working spaces. Between working you can unleash your inner yogi, ride some waves or just swing in a hammock on some of Sri Lanka’s most unspoilt beaches – a chilled nomad is a productive nomad! Thailand’s crazy capital might not have the same laid-back, nomadic community that’s found in Chiang Mai, but as the hub of South East Asia, Bangkok is still a brilliant place to live as a digital nomad. It’s not all backpackers and hedonism you know! Just be sure to base yourself away from Khao San Road if you actually want to get some work done – I know how tempting those buckets can be! The northern side of Bangkok has a large congregation of digital nomads, but the availability of free WiFi throughout the city means you can work pretty much anywhere. Germany’s hip capital may not be the cheapest place on this list, but the amazing quality of life on offer, combined with cool neighbourhoods and oodles of creative energy, keeps it a top destination for digital nomads. Fashionable areas such as Kreuzberg and Neukölln are well-trodden territory for remote workers and are packed with alternative co-working spaces. Not to mention that their eclectic, colourful streets provide the perfect backdrop to any Instagram feed: influencer heaven. By western European standards, Lisbon is an extremely cheap place to live – just one of the reasons that digital nomads love it so much. It’s home to a growing number of start-ups and its tech scene is beginning to boom. Café culture is thriving and seriously affordable – you can order a coffee for less than €1 to power yourself while you work, where you’ll likely be joined by a handful of others doing the same thing. There’s a real sense of community among digital nomads here; there’s even a Facebook group where you can keep up to date with local networking events and meet ups. South Korea is at the forefront of technology, so its bustling capital Seoul is an amazing place to base yourself if you’re a tech-focused nomad. It just so happens to have the fastest WiFi in the world! The uber cool Hongdae neighbourhood is especially great, with a number of co-working spaces to get the job done. It’s also the best place to experience the famously wacky Korean nightlife, so it offers the perfect balance between work and play. Taipei is another city that’s superb for nomads specialising in tech. Taipei isn’t as established as Seoul on the digital nomad trail just yet, but it’s a great place to base yourself if you like staying one step ahead of travel trends. It’s one of Asia’s most dynamic, modern cities where start-ups are being launched left, right and centre. If you tire of the hustle and bustle you can easily escape Taipei to explore Taiwan’s beautiful beaches, green mountains and rural villages. Taiwan is so tiny that it’s a breeze to explore the entire island on the days you don’t feel like working! Sao Paulo is the business hub of South America and one of the most exciting cities in the world. The hipster neighbourhood of Vila Madalena is the perfect place to get your creative juices flowing, as you’ll be in the good company of artists, musicians and of course digital nomads. There’s something new to discover in every colourful corner of this quirky suburb, so your workspace on any two days need never be the same. When it’s time to close the laptop and let your hair down, you’ve got plenty to explore in the biggest metropolis south of the equator. The post The best places in the world to be a digital nomad appeared first on Hostelworld Blog.